Welcome to the forty-seventh week of my Tuesday's Truths. This day happens to be Independence Day and a number of my figurines are celebrating! 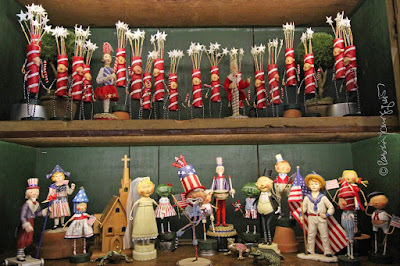 In the photograph atop this entry, all of my firework-themed figurines (dressed in red and white) can be seen rehearsing with two directors. One of them will be the mistress of ceremonies. She is wearing a red skirt and a blue top with white stripes. Her hand is clasping a baton that's been decorated to resemble a firework, and she is standing towards the left/center of the first row. Her partner, the master of ceremonies is wearing a red jacket and white pants with blue stripes. He is also holding a baton that's been decorated to resemble a firework, and he is standing towards the right/center of the first row. Their intention is to have the fire-work-themed figurines perform immediately after the completion of a vow renewal ceremony, where all the guests in attendance are wearing patriotic outfits. They can be seen in the bottom half of the aforementioned image, and many of them are ones you might recognize from prior posts here on Blogger. is doing her own thing, by carrying an apple to honor NYC, which as you probably know is often called The Big Apple. She has also appeared in prior entries on Blogger (without her apple) including ones that you may reference by clicking here as well as here. And this year, I have two newcomers! They can be seen in the next image. 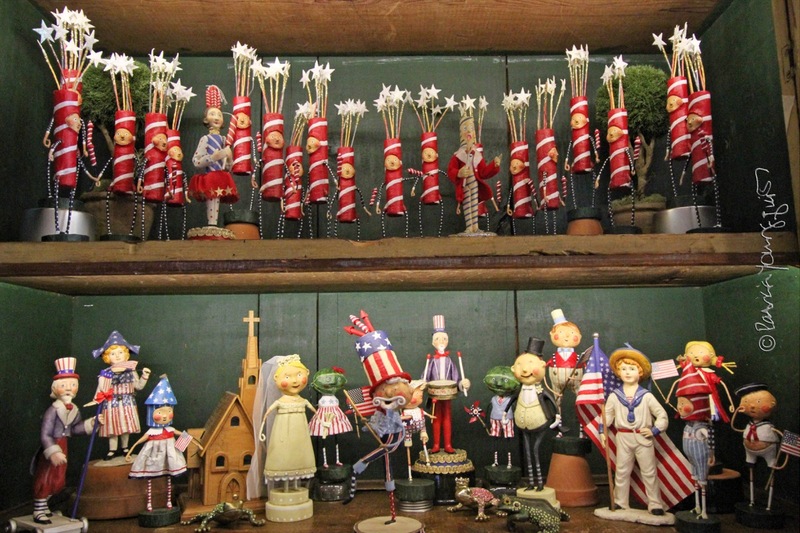 Each figurine has his/her own agenda, however, they all share one thing in common: Every one of them joins me in wishing you and yours a safe as well as celebratory Independence Day!